I moved to the West country, and in one fell swoop, quit my job, maxed out my credit card on musical instruments/equipment, and took to the streets. Many people reach a crossroads at a certain point in their lives, and when you do choose to change direction, at first there seems to be so many opportunities to turn back, to step back, to go back towards safety! I reckon, if we keep up our decision for a period of time, that we then cross a threshold, and the other way, the old way stops calling. 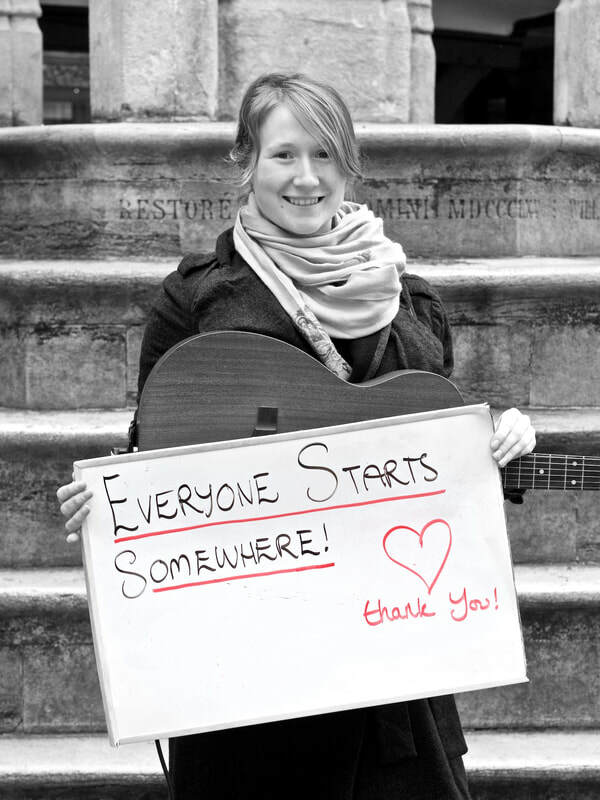 For me, I had SO many doubts about taking to the streets and busking. So many! But my now mounting credit card debt, and the fact that I'd closed the door behind me when I left my old work, meant that it was go hungry, or face my fears. So I faced them. With full trepidation. I walked sloooowwwllllyyyy to the appointed buskers spot. I took for...ev...er...to set up my equipment, my case, my microphone, my microphone stand, my microphone lead... But, at some point (rather late in the day by then), it was all set up and there was nothing else for me to do other than sing something or leave. And by that time it didn't seem so daunting. I made £38. I sang for 2 hours and I made £38. I was overjoyed!!!! In perspective, this was not very much money, but the point was, people GAVE me that, for my singing! They LIKED it! At least, some of them did, and of that 'some', some of them shared their money with me! And I thought to myself, I can DO this! I can make a living, and spend my time singing to people! And so I carried on! Over time, I got to know ALL the towns in the West country, and eventually all the towns in the south of England too. I bought a campervan, moved into it, and travelled around, singing for my suppers! I made friends everywhere I went, old people, young people, rich, homeless, other buskers, other market traders, police, everyone. And now and then, I touched people with my music, and that meant everything to me. For that one person who stood there and cried, or shared with me a story about their life, all the fear, the nerves, the endless poverty, the occasional abuse, was all worth it. Music was my whole life! Yes, the winter was cold, but you know what? I had a little fire in my van, a little wood burner that I used to light every night before looking out at the stars around me and breathing in the crisp, English country air! Life was delightful! Life was perfect! And then I did something risky. 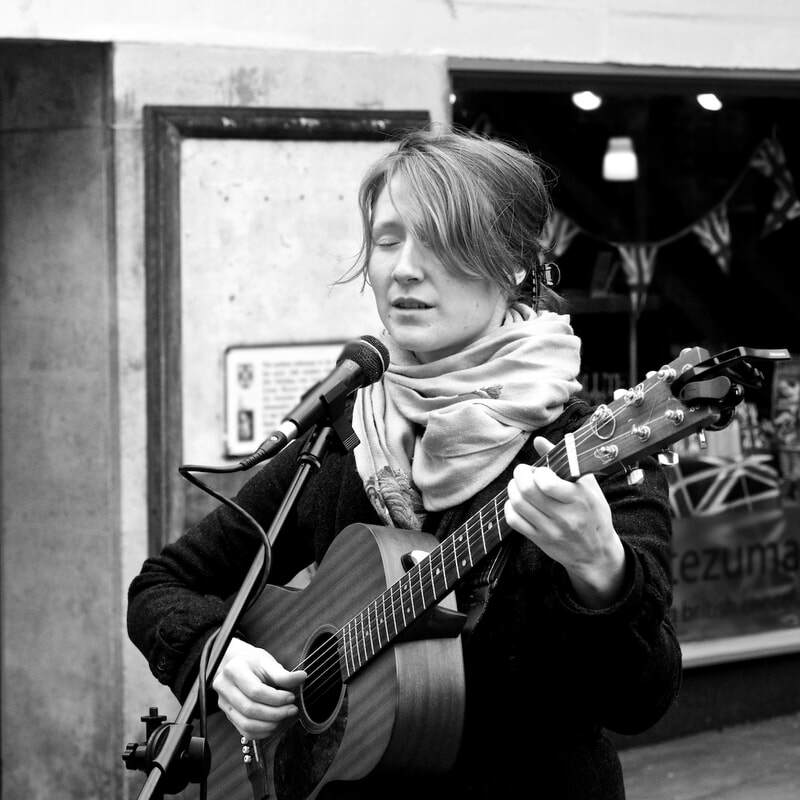 Both photo's courtesy of Mike Hall, taken in Winchester while busking. "Tour! Ah, yeah...of course, my upcoming album, ah...yes, it's coming out early next year, and, ah, yes, we are touring it nationally. With a band! All across the country! Yeah..."
​I didn't have those things. But in that moment, I felt I could! It was either that or apply for a regular job (winter was coming and I couldn't sustain myself just by busking), so this is what marked a crossroads for me. ​Now, in order to record, the first thing you need after the songs themselves, is MONEY. And that is something I didn't have. Never have had really. Hope that changes one day!! So I launched, ONE LAST, hopeful attempt at continuing my career with music by crowdfunding to make an album. ​I launched the campaign to the small group of people that were aware of my burning desire to make music, but it didn't look promising. ​I applied for a job at the local 24 hr Tesco's. 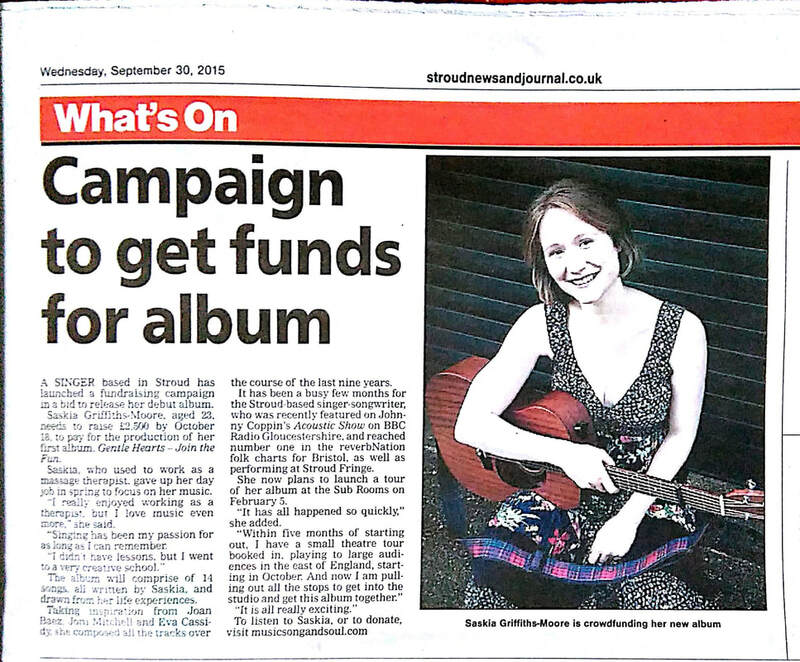 20 minutes before the end of the crowdfunding campaign, my mum shared it on her facebook page, and one single person in America (who shall remain anonymous, but forever in my heart), whacked a grand onto my campaign, taking it over the threshold and allowing me to carry on with my career and record an album! ​Lucky really. Tesco's got back to me. They were not interested in employing me at this time. It feels appropriate to share this song with you. This is one of my *rare* happy songs about sticking with music, about how hard it was for the first 2 years, but how much I loved it, and after all, how it's all for YOU, the listener, the audience, the recipient. Everything I do with music I do for YOU, to give YOU a good time, a kind word, a musical experience. And this song is for you. 'ALL FOR YOU'. ​The video below is also PROOF of my busking :) Enjoy! And don't forget we have a LIVE STREAM today at 4pm FROM THE STREETS. Where I used to busk! I will be wearing headphones, answering questions, and might sing a little something! Tomorrow I'm going to show you my first ever music video featuring an aerial silk artist, and we are going to do a LIVE SESSION IN THE AERIAL STUDIO with the performer! Seriously, that is NOT to be missed!! And if you liked my music, you can always give me a tip​ using my paypal.me tip link. No pressure at all, I love that my music is free for people to enjoy, and the whole drive of this campaign is to reach more people with my music and my stories, but sometimes, there comes along a person who has a little extra, and is able to help support the arts, and to support my music. You know what? Here is another sweet story - a wonderful woman (who's name once again shall remain anonymous) wrote to me last October saying, 'Saskia, I earned a little extra this month from my art, and I'd like to make a donation to you'. And that was one of the sweetest things anyone has ever said or done for me! So if you have a small token extra you'd like to share, here is my online tip jar.